Description: In 1840, the famous organ building firm J. Batz & Co (Utrecht) was contracted to build a two-manual organ for the Reformed Church in Mijdrecht. At delivery, two extra stops had been added, a Cornet and a Trumpet. This implies that Batz did not find it necessary to draw the Trumpet before the Mixture, as is suggested by organist Johann Wilhelm Lustig at the end of the 18th century. 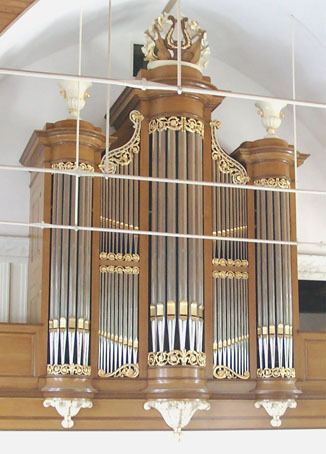 Remarkable as well is the 5 1/3'-rank of the Mixtuur, as the organ has no manual 16' stop; this may seem illogical nowadays, but it is obvious that Batz and contemporaries did not design organs with overtone-systems in their minds. At delivery, two extra stops appeared to have been added, a Cornet and a Trompet. Elements of the Batz fronts that T.F. Suys designed in Amsterdam and Utrecht determine the five-part front at Mijdrecht: the sections between the towers are flat, the organ has no wings. The organ was changed in 1915 (Vermeulen added strings, a Vox Humana, a Bourdon 16 and pedal couplers), 1961 (Bik added a Sexquialter, replaced the Vox Humana with a Nasard) and 1972 (Verschueren, restoration of the Batz chests and tracker action). Organ builders Van Vulpen (Utrecht) restored the instrument in 1998-2001. The specification of the manuals was reconstructed, the three-stopPedal is new, the pedal couplers were renewed.